Isn't that by the same people who butchered the Rockman? Electronics4music? Try the Audio Damage Fuzz Plus, it's got an ugly GUI, and sounds great. But nice GUI's man, sure beats the generic Cubase ones. Incredible GUI's. I had downloaded simulanalog before, but couldn't stick with the bland look. I'm a very visual person. I gotta have the look to inspire the sound. Crazy I guess but just how I am. You are doing a great service here man. Kudos. Man, this is tooooo good. Thanks!!! I'm confused as to how these work. Do you simply put them in the VST folder with the original plugin, or is there something else that must be done. Thanks. I have some problems with the gui versions of the simulanalog guitar suite on FLStudio 9.
when I fire up any of the plugins there is no more audio passing through that channel....I don't have the problem with the gui-less version. maybe these are the plugins that cause me some problems on Tracktion too...I must do some checks. I'd like to know the same info - how do you use/add the GUI properly? I'm barely tech-capable as it is. Do you just put the de-compressed file into the VST Folder? Just tried them in VST Host and THEY WORK. You dont need anything else, just the dll files. Put the dll files (Fender/Marshal) etc, into your VST folder in Cubase/Tracktion etc, then open them in the sequencer. 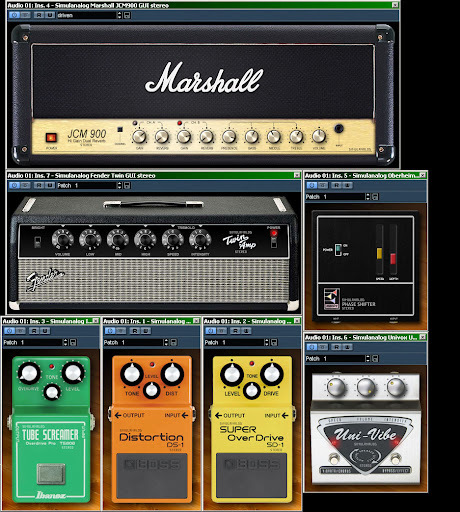 I found GUI ones before but they did not work in VST Host but these ones do and they seem very nice. Work great in Ableton Live 8, and Adobe Audition 3. THNX! Thanks for all of the hard work, by the way! I get no sound at all from any of them - the GUIless works fine... They look beautiful! I'm running Windows 7 32-bit and Reaper 4 - I load the bland ones (JCM & TS) - close them then load the fantastic looking GUI versions and bypass them (or there's no sound from anything) - that way I get the sounds and still have the beautifully rendered GUI's. Anyone know why the GUI versions give me know sound but the plain wrapper ones do? As I said if I run the plain one (JCM or any) I get sound - If I then insert the GUI version it kills all sound unless I bypass it????? Awesome GUI for the Simulanalog VST's. I don't have any presets. I did, tried one of them once and then they weren't there anymore. Any help would be great!! Thanks. 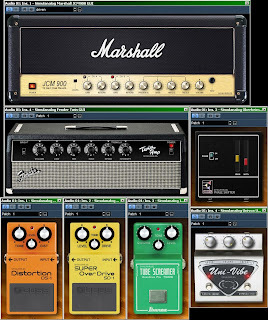 Are these GUI'S alredy loaded with the amps ? Or do that have to be added to the actual amp plugin ? And if they need to be added to the amp plugin,how is that done ? Nice GUI but for some reason it crashes KORE 2 Host. Any idea of what's going on? Guys, for all you having trouble with no sound from the plugin. Im using fl studio and you have to put it into FL studios vst folder not the vst folder that you have all your other plugs in. Put it into program files>imageline>Fl Studio 10>Plugins>VST. Thats what got it working for me. Cheers! Tested them, sound awesome, and the GUI is brilliant. Thank you. If you're using Cubase and you're not getting any sound, just put them inside Cubase\VstPlugins\. The download link doesn't seem to be working. Are these still available? Guess I got mine "just in time" went to DL for a friend and they are gone! WOW. SIMULANALOG was so cool sounding that people made the exception and used it without GUI. It's not normal, people DONT use plugins missing GUI. And now, you are even adding GUI to it. Too cooooool to be true, hope it works! Like some previous posted wrote, the .dll's worked, but couldn't get the GUI's to work. I put the GUI.exe's in C:\Program Files (x86)\VSTplugins, right clicked and ran the GUI.exe's as an administrator, the GUI opened up and a folder was created inside the VST folder. Tried the plugins in Reaper and they worked fine. Hope this helps someone. Thanks! You figured it out for me. Test for Fender Twin simulation. I tried in many files of Mixcraft but I get no sound,anyone works with mixcraft7? I am new to all this plugin and VST stuff. What is a GUI? And how do I use cabinet IR packs? Doesn't seem to work with Ableton, why? I wish they would work in Sonoma Wire Works Riffworks Standard. I tried using them but it showd me a No Editor error. Why? Anybody has the tube scream gui? I'm not able to get the GUI to work. Whenever the switched on no sound comes out. I'm using Reaper and have put them in the FX folder. I tried following the advice of another poster and running the exe files as an admin. It created the folders for each sim, as he described, but the resultant files were just the old non-GUI dll and an SEM file. Not sure what I should do next. Same thing for me, it gives no sound. But when i turn off the switch i hear the unaffected sound.